How About a Little Spiritual Boost? “I found the activation to be so powerful and loving, I have listened to it nearly every day since then. 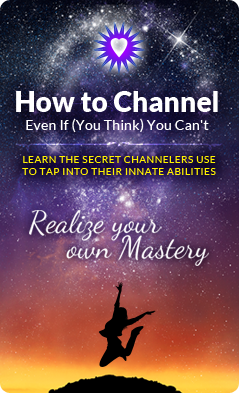 The activation asks me to be open to whatever I am ready to integrate. Over these months I have integrated a lot I can tell you! I don’t usually know in advance…things just come up in the present moment. 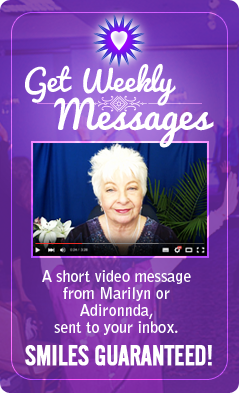 Each month, Marilyn channels Adironnda & Company who deliver a very special message to our subscribers. The session is always on the Double Digits of the month. So, 3/3, 5/5, 10/10, etc – whatever day that is, the session is held online, a webcast, at 6PM Pacific. The message is always about those Double Digits. 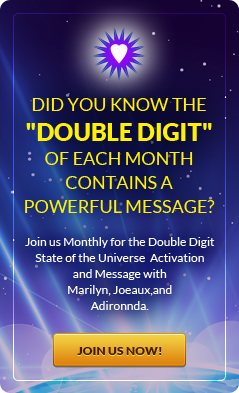 You see, numbers have powerful meanings in the Universe and carry special, amplified meanings when they are Master numbers (such as the Double Digits) and even more so if they are triple numbers. Sometimes, the session will bring messages from Raphael, Gabriel, Master Jesus, or any number of Spiritual teachers. Other times, it is simply Adironnda – – – which is entertainment in and of itself. They can shed light and laughter on just about any subject. There’s always a Spiritual message each month and there’s always either an activation or a mediation. The really cool thing is that subscribers can ask questions, too! So, it is also interactive. It’s amazing how powerful it is when you get all of those subscribers online at once, raising the energy and setting beautiful intentions for the Planet. If you can’t make a session, everything is recorded and we send out the replay within 24 hours. If you prefer to get the session on CD mailed to your home, we can do that, too!